[New for 2013, discontinued] Now I'm one of those old school people that doesn't understand why all ice cream isn't just milk, cream, sugar and flavoring. I mean, I get that they add in chemicals for texture and longevity, but do we have to do these things? That's why I love it when companies have all natural lines. Sure I would prefer everything be all natural, but if I can't have that, at least give me a few flavors that I can fall back on in a pinch. 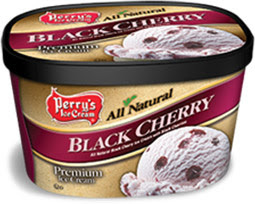 For Perry's Ice Cream of New York, this means a simple all natural line up of Vanilla Bean, Chocolate, Chocolate Chip, Maple Walnut, and their newest offering: Black Cherry. It's a fairly standard offering of all natural black cherry ice cream with black cherries. Nothing crazy, just simple and straightforward. Let's see how it goes. Hehehehe, looks more like black raspberry than anything else. Well, it definitely has that all natural texture, there's a smoothness that you just don't see with today's chemicals. The flavor is surprisingly tame, it smells way more potent and tingly then it tastes. 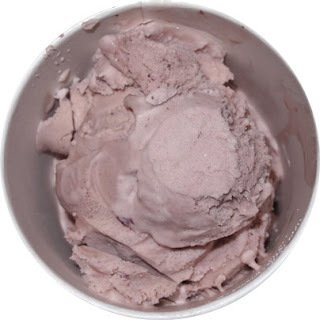 It's a milky cherry flavor that's easy on the taste buds. It's a cherry flavor for those of us who aren't big into that cherry tang we find in so many other flavors. There are tiny cherry bits everywhere, but it you get a big chunk, yeah, it's got a little bite to it. Alright, that's all I got! I too wish everything would be simple when it comes to ice cream. To me, when you cut corners you have to rely on chemicals and bells and whistles. You can never go wrong with black cherry in my book!